Give your installation and service operation a more professional approach to calibration and configuration, saves time, improves accuracy, provides your organisation with more added value customer service options. You can upload customers original calibration files from your saved files at any future time, the service possibilites are endless. 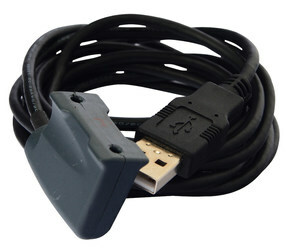 The opto-link USB is an Opto-isolated Data Coupling cable that connects to the USB port on your PC. The link itself has a USB connector at one end and a simple infrared magnetic setup port at the other end that you place on the front display of your digital display. With PT’s software viewer program you can access the setup and calibration of your digital indicator, or many of them! With simple point and click set up, you can configure your digital indicator and save the setup files. Great for after sales service or troubleshooting, you can upload and download the configuration files to/from other indicators. Monitor and log weighing operations! The viewer software is available free of charge.